It’s been a while since we added anything to the Bioscope Library. The latest addition is James R. Cameron’s The Instruction of Disabled Men in Motion Picture Projection (1919). Cameron was Instructor of Projection at the Red Cross Institute for Crippled and Disabled Men, in New York. 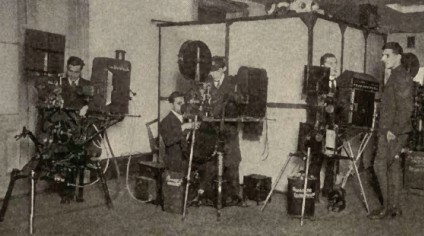 The Institute sought to instruct soldiers disabled during the First World War in suitable professions, and motion picture projection was one of them. As Cameron tells us, “almost any man with both hands intact could, with a course of study of about two months in duration, acquire sufficent knowledge to enable him to enter an operating booth, and take charge of the machines”. Twelve pupils joined the inaugural class in May 1918 – “Most all were leg cases, either paralysis or amputation”. Cameron tells of the success of most of those undertaking the course, their earnings, and the elements of training that they received. The remainder of the booklet is then concerned with the practicalities of motion picture projection, with illustrations, terminology and lengthy question-and-answer sections, all presumably derived from the course itself, though little further mention is made of disability. The booklet therefore serves as a standard technical guide to projection at this period. However, there is more to the history than this. There is an exceptional website, Project Façade, based on a 2005 National Army Museum exhibition, which looks at the treatment of facial injuries of British soldiers during the First World War. Some men had injuries so terrible that they were unrecognisable to family and friends, and, as the site says, “unable to see, hear, speak, eat or drink, they struggled to re-assimilate back into civilian life”. The site celebrates the pioneering plastic surgery undertaken by Sir Harold Gillies, but even with surgery and prosthetics etc., some men remained so disfigured that they felt they could not return to normal society. The site tells us that one profession that remained open to them was that of projectionist. Such men could arrive for work before anyone else, spend their working day on their own, shut away from society, and then return home in darkness. This sad revelation may be what partly lies behind the Red Cross Institute’s interest in the profession, though Cameron’s booklet, perhaps not surprisingly, makes no mention of it. 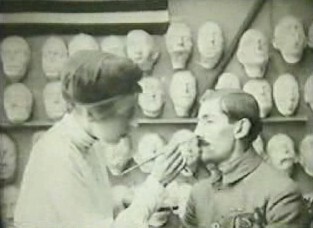 Project Façade also has a remarkable film on the making and fitting of tin masks and facial prosthetics for injured servicemen, from around 1916. There is no information on who made the film, or where it came from, but I do encourage you to see it (it requires QuickTime and is available in small and larger versions). It is gentle and inspiring. It contains nothing particularly unsettling, but do be warned that there are images elsewhere on the site which might upset some. The Instruction of Disabled Men in Motion Picture Projection is available from the Internet Archive, in DjVu (4.3MB), PDF (14MB) and TXT (161KB) formats. The BBC is putting on more for the Albert Kahn and autochrome addicts among you. This Monday BBC2 starts a three-part series The Great War in Colour: The Wonderful World of Albert Kahn, which looks at the First World War through the colour photographs in the Kahn collection. Part one is on 21 January, at 19.00. The programmes are streamed online via BBC iPlayer for one week after transmission. Note: If you are new to this site and looking for background information on Albert Kahn, please visit the Searching for Albert Kahn post.